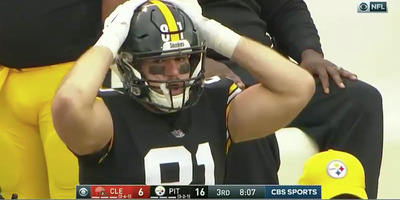 CBSThe Pittsburgh Steelers gave the Cleveland Browns the easiest turnover you’ll see all season on a punt after a safety. The Pittsburgh Steelers gave up the easiest turnover of the year to the Cleveland Browns on Sunday. After a safety, the Steelers failed to field the Browns’ punt, leaving a live ball sitting on the ground for the Browns to pick up unopposed. The Browns would score their first touchdown of the game on the ensuing drive. The Pittsburgh Steelers gave up the easiest turnover you’ll see all season to the Cleveland Browns on Sunday after appearing to forget the rules of a punt following a safety. The Steelers had extended their lead to 16-6 after the Browns were called for holding in their own end zone for a safety, giving Pittsburgh two points and the ball. On the ensuing free punt, the Steelers called for a fair catch but chose to let the ball drop after an apparent bit of confusion amongst players looking to field the ball. On a normal punt, letting the ball drop would be fine, as the ball first has to touch a member of a receiving team before it becomes live. But because the punt after a safety is a free kick, the ball was live when it hit the ground, and Browns players pounced on it unopposed to retake possession. The Browns would score a touchdown off of the turnover, but miss their extra point attempt to cut the Steelers lead to 16-12. At the highest levels of football, it pays to know the rules.